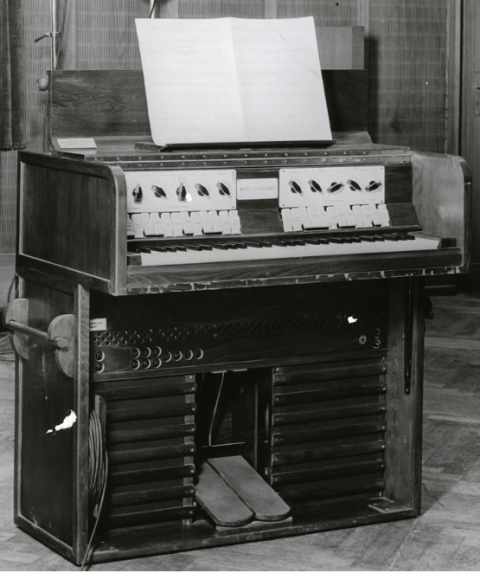 The ‘Electric radio Organ’ was built to test the practicality of broadcasting electronic organ music over the radio rather than recording real pipe organs on-location with with the primitive microphones of the day (similar to the ‘Givelet Coupleaux’ Organ in France). 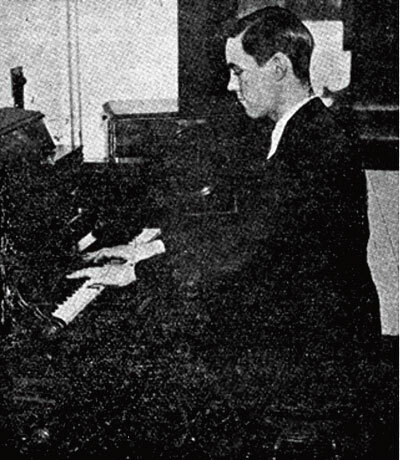 The organ’s debut was at Pittsburgh’s KDKA radio station in 1930. 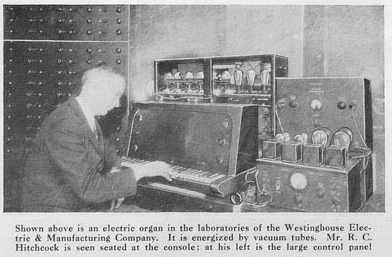 A New Instrument, Called a Radio Organ, is Demonstrated in Concert by Dr. Heinroth. United Press Staff Correspondent. PITTSBURGH, Jan. 23. The squeals and squawks that are the bane of radio fans have been brought under control and combined in music rivalling that of the pipe organ. 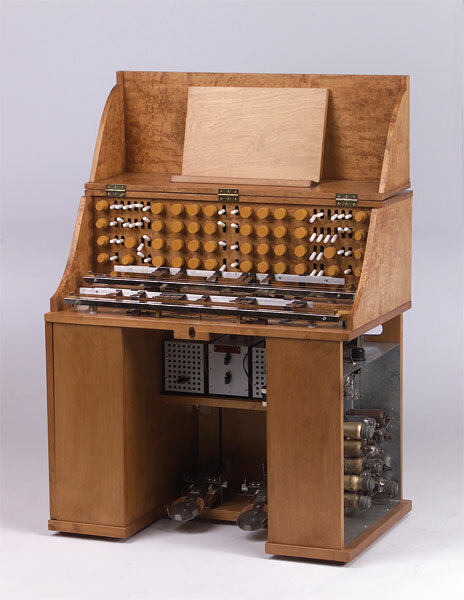 The new instrument, in fact, Is called a radio organ, and SO oscillating vacuum tubes replace the pipes. 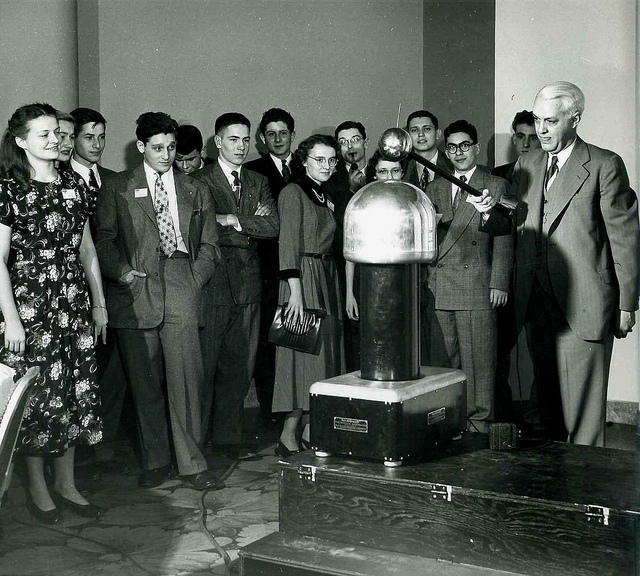 The first concert on the radio organ was played by Dr. Charles Heinroth, noted musician of Carnegie Institute, and though the event was not without a few impromptu notes, the half hour program amply demonstrated that the noise of radio tubes can be made beautiful. 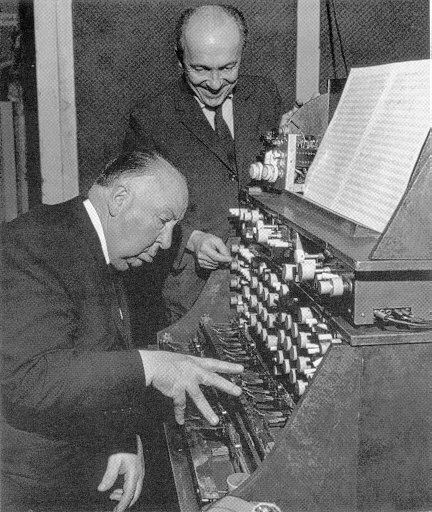 The radio organ is the product of the genius of R. C. Hitchcock of the Research Department, Westinghouse The keyboard is like that of a regular three-octave organ and foot pedals to control the volume are provided.” The touch of a key plays the proper note ‘by causing one of the’ tubes to oscillate. The electric impulses thus set up may then he carried directly to a loud speaker which transforms them into sound. 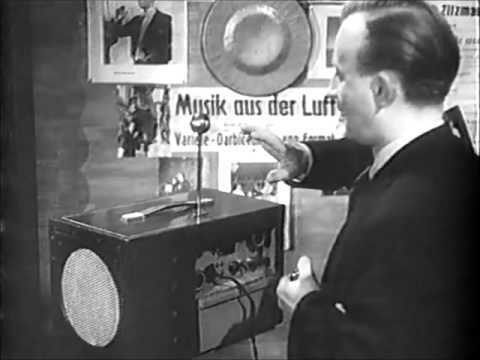 But they need not be transformed into sound at once, and this fact is held to open a vast realm of possibilities for the radio organ.. For instance, the music that is to say, the electrical impulses set up by the oscillating tubes may be broadcast without use of a microphone and not become audible until it is picked tip on the receiving sets. Likewise the possibility of a central organ with the music wired to several churches or theatres may -be easily be envisioned. 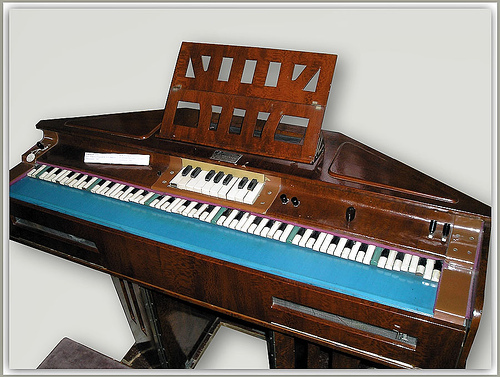 Another advantage of the radio organ is that all the mechanism of the instrument may be placed in a basement room, with only the keyboard visible. 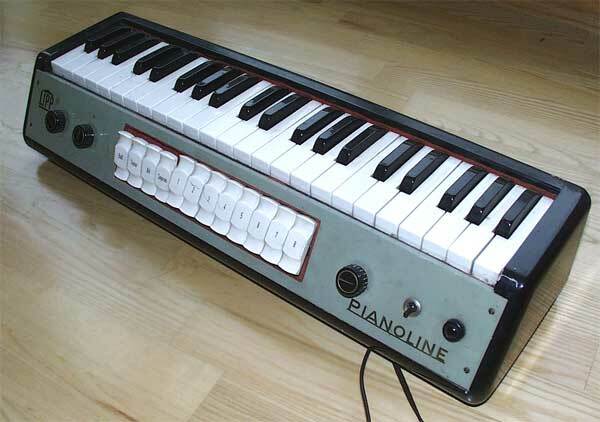 The Lipp Pianoline was a monophonic vacuum tube based keyboard instrument designed as an add-on for piano players. 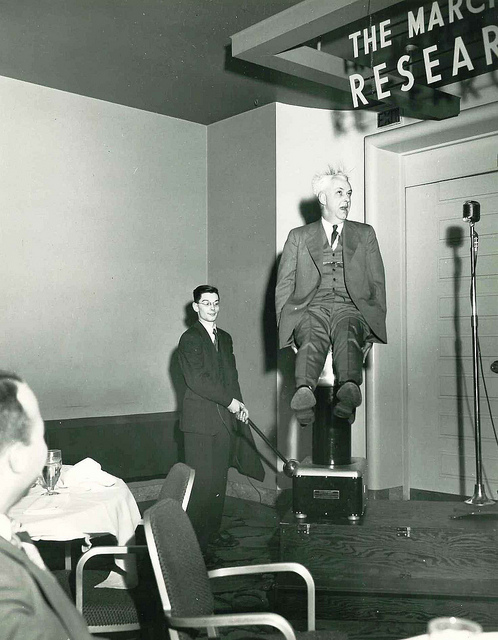 The Pianoline was part of a family of portable piano-attachment instruments popular in the 1950’s such as the Ondioline, Clavioline and Univox – the Pianoline being distinguished by it’s larger sized keys. 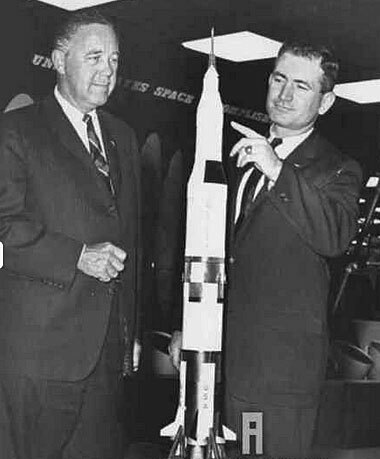 The instrument’s sound was generated by a number of astable multivibrator vacuum tubes and monostable multivibrator tubes for frequency division. Tone colour was added with filters, pre-amplification and vibrato. In contrast to similar keyboard add-on instruments, the tone generator and power supply were built into the keyboard unit rather than as an external module. 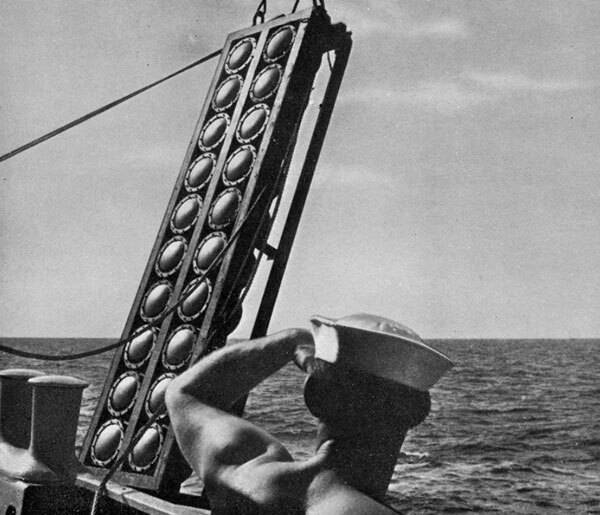 The resulting sound was fed to an external, portable loudspeaker unit using an output cable. 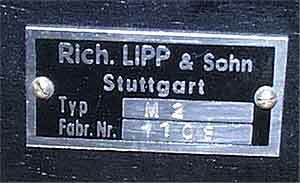 The Pianoline was designed and built by the established Stuttgart based Piano manufacturer Richard Lipp & Sohn who were looking to diversify in the postwar market for electronic keyboards. 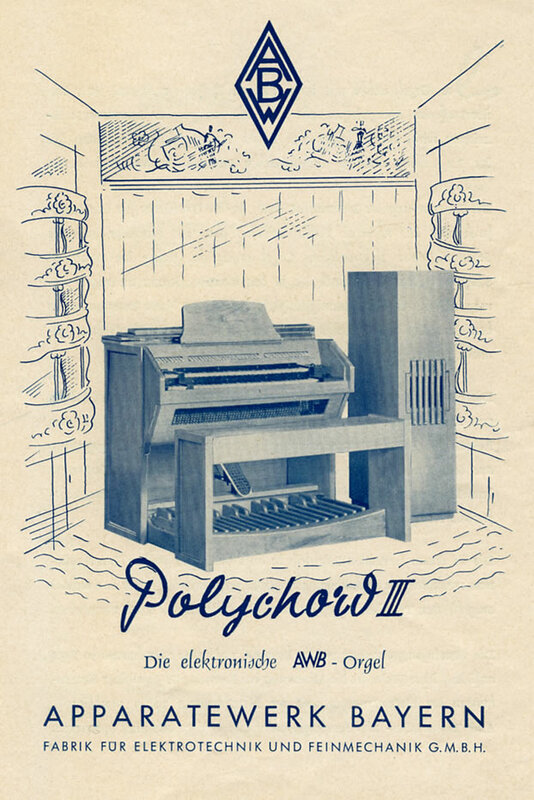 In 1970 the company was acquired by the Jehle Piano Company and closed in 1972. 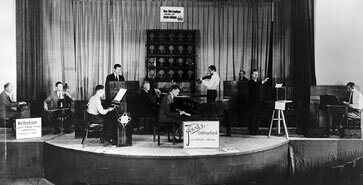 Later developments of Freidrich Trautwein’s original Trautonium were continued by the Trautonium virtuoso and composer Oskar Sala. 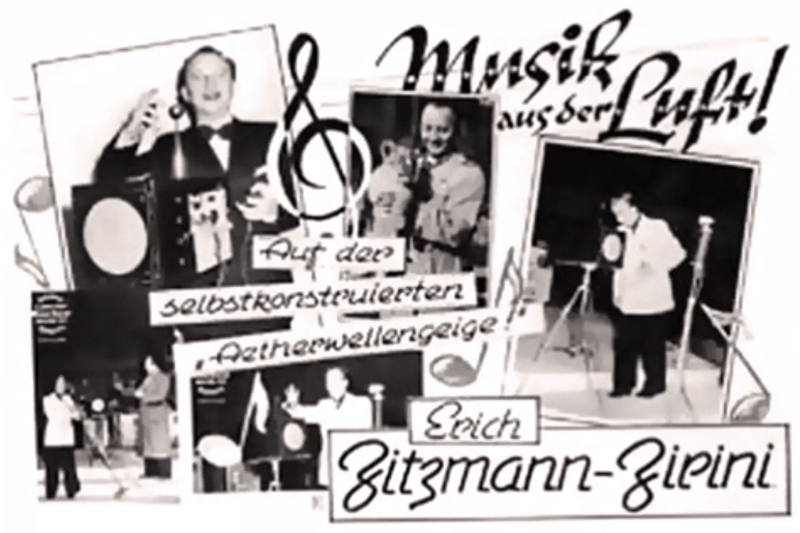 In 1936, Sala christened his first instrument the ‘Rundfunktrautonium’ (‘Radio-Trautonium’) and also developed a concert version, the “Konzerttrautonium”. 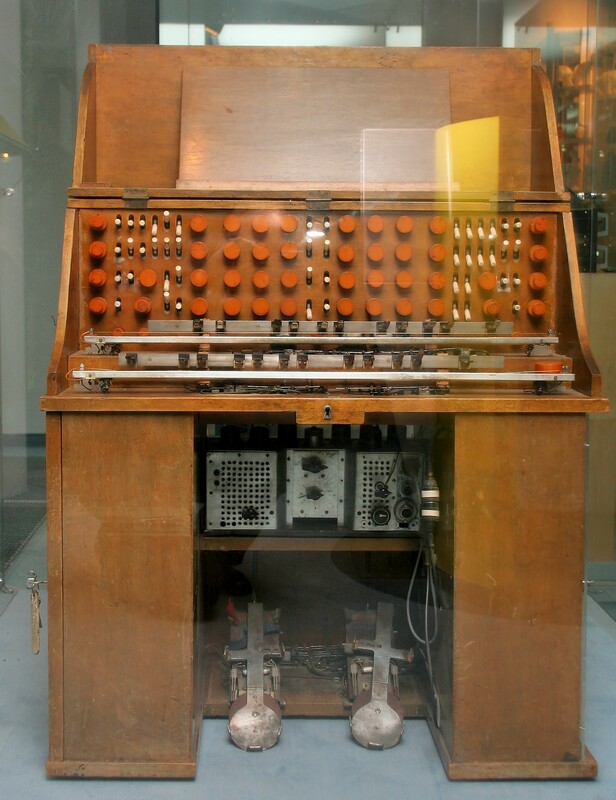 After the end of the Second World War the instrument was re-named the ‘Mixturtrautonium’ but all were essentially developments of the original subtractive synthesis principles of the Trautonium. 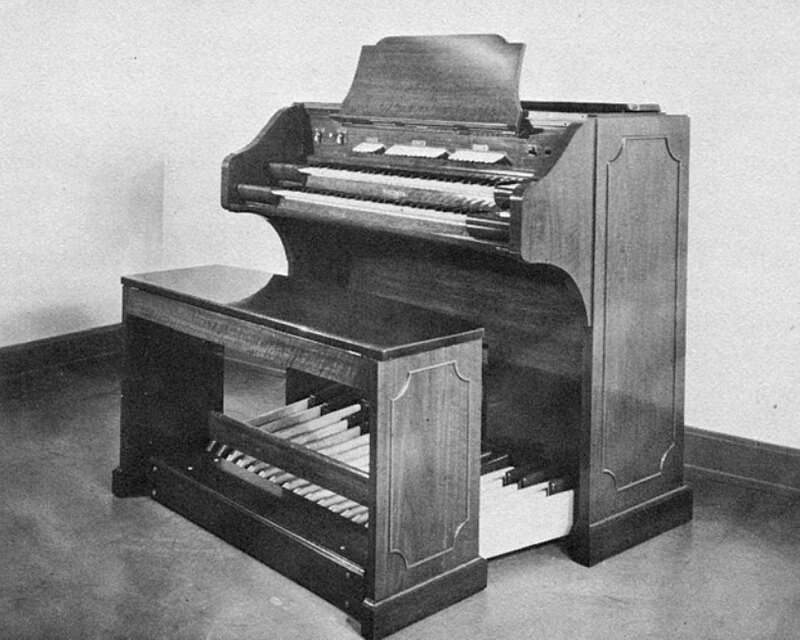 The essential design principles of the Trautonium were retained by Sala; sound production on the basis of sub-harmonic ‘mixture’, and the method of playing with two string manuals. The latter are made of wire-covered catgut strings which act as variable resistors. according to the position at which they are pressed againts the contact rail beneath them, they control the frequencies of the electronic sound generators. when the finger glides over the string a continuous glissando results over the entire tonal region which has just been tuned up. 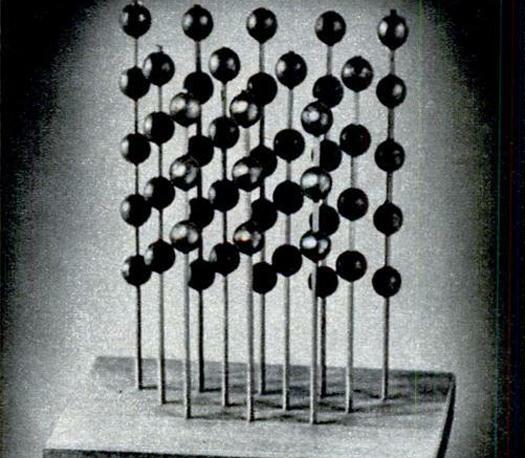 Micro-tonal intervals could be produced on the Mixturtrautonium. To ensure accurate contact with the notes leather covered sprung and moveable metal tongues are added to each string. Unlike with a vibrating string, the gradation of the electrical-resistant string manual is linear and not exponential so that all octave have the same finger range. 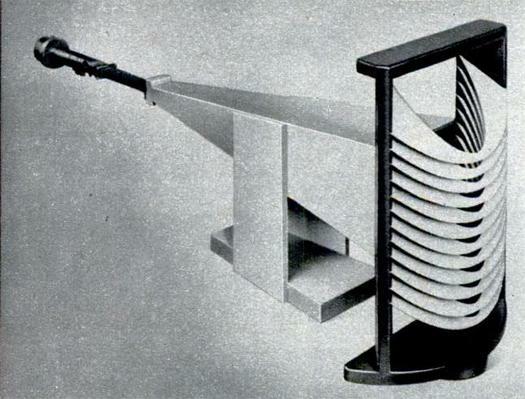 The 1948 post-war Mixturtrautonium was a polyphonic version of the original Trautonium, generating sound from two AEG Thoraton tubes with a 3 ½ octave range (which could be extended with an octave switch). The instrument could also be controlled with a foot pedal that not only allowed variation in volume but also with a lateral foot movement, select three different sets of sub-harmonics. 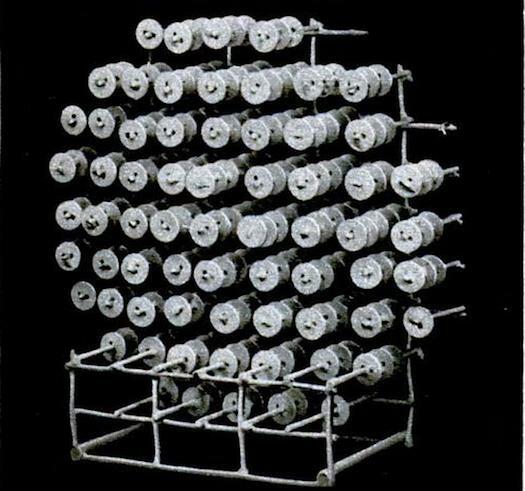 The Sub-harmonic ‘mixture’ technique basically used un-natural low frequency harmonics to modulate a sawtooth signal creating complex harmonic ‘mixtures’ which could be further coloured with noise generators, mixers, an envelope controller and a frequency shifter. 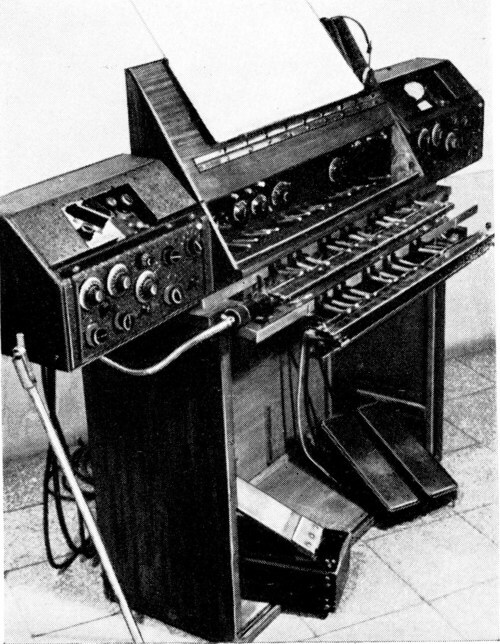 During the pre-war period, the ”Rundfunktrautonium’ was used extensively for film and radio broadcasts and after Paul Hindemith’s endorsement, became the instrument of choice for ‘serious’ electronic music composition (Hindemith’s switching of allegiances from Jörg Mager’s Sphärophon family of instruments to the Trautonium signalled the end of Mager’s career in instrument design). 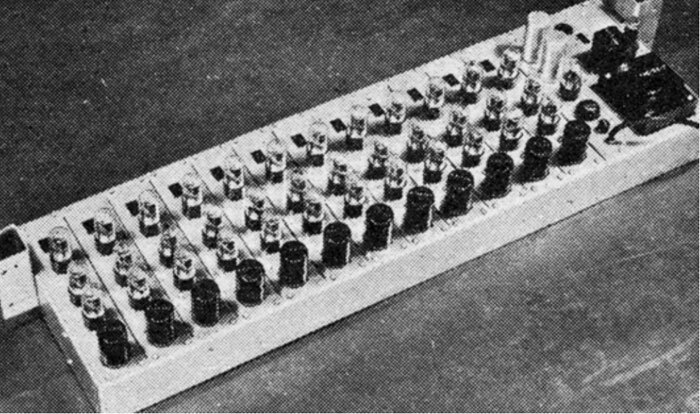 A portable version, the ‘Konzerttrautonium’ was designed in 1936 specifically for the composer Harald Genzmer’s ” Conzert für Trautonium und Orchestrer” and saw more than fifty performances before the outbreak of the war. 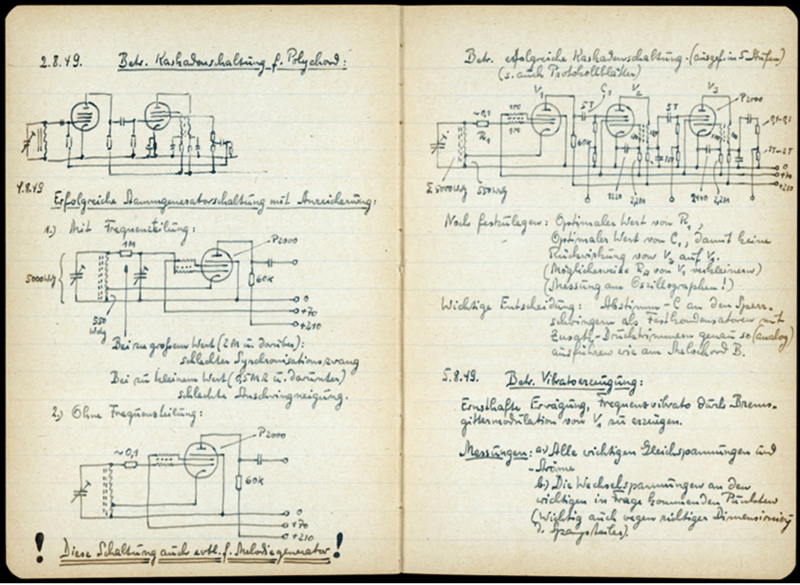 Berlin had in the early Thirties become the world capital of electronic music, with inventors and designers such as Jörg Mager , Oskar Vierling , Fritz Sennheiser , Bruno Helberger, Harald Bode, Friedrich Trautwein and Oskar Sala (with much of the work centred around the Heinrich-Hertz-Institute). These instruments often explored radical new approaches to tonality and expression and were enthusiastically adopted by the avant-garde of the period. 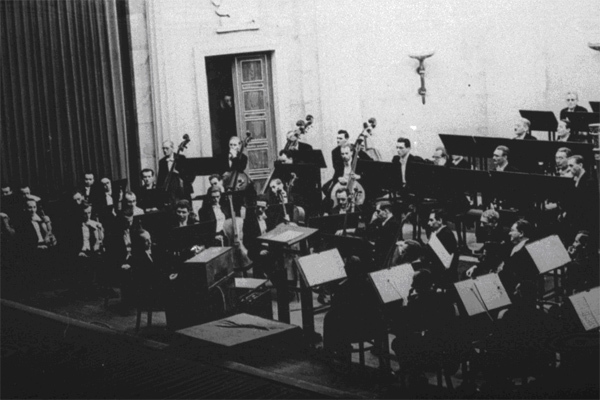 This period of musical ferment coincided with the seizure of power by Adolf Hitler’s National Socialist party (NDSAP), who initially tried to absorb this strain of modernism for their own propaganda ends – indeed, the name ‘Volkstrautonium’ echoes the name ‘Volkswagen’ as a peoples instrument for a modern, new Germany. On the 18th August 1933, Joseph Goebbels (Hitler’s Propaganda Minister) presided over the IFA ‘Internationale Funkausstellung’ (International Radio Exhibition) in Berlin. 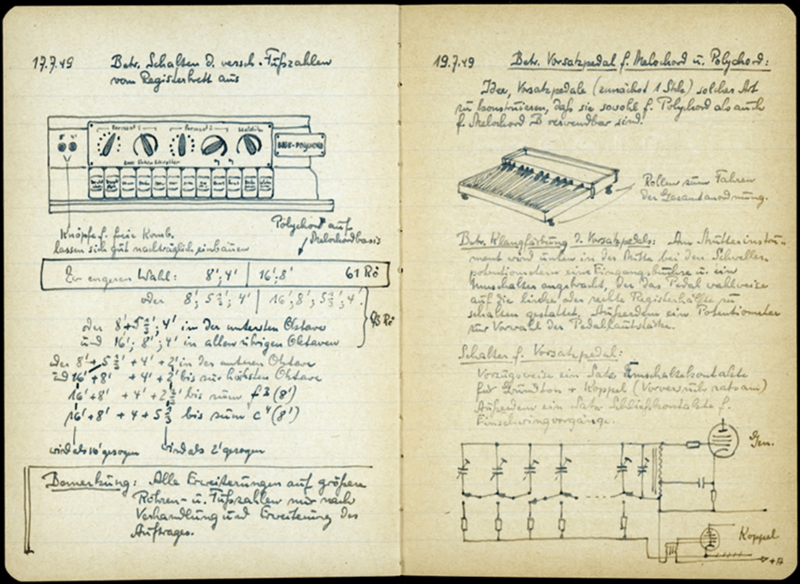 The music for the exhibition was provided by the ‘Future Orchestra’ (Das Orchester der Zukunft) composed of the most advanced electronic instruments of the time: The Volkstrautonium played by Oskar Sala, Bruno Helberger’s Hellertion, Oskar Vierling’s Elektrochord , the Neo-Bechstein of Walther Nernst, a collection of electric violins and cellos and Leon Termen’s Theremin. Luckily Trautwein knew a general who was on our side and arranged that we could play the instrument to the minister of propaganda Joseph Goebels, Hitler’s right hand man. I Played something by Paganini and of course he liked it. After that, they left us in peace. After the end of the war Sala founded a studio for film music soundtrack production in Berlin,where, amongst many other projects, he recorded music for Hitchcock’s “the birds” .